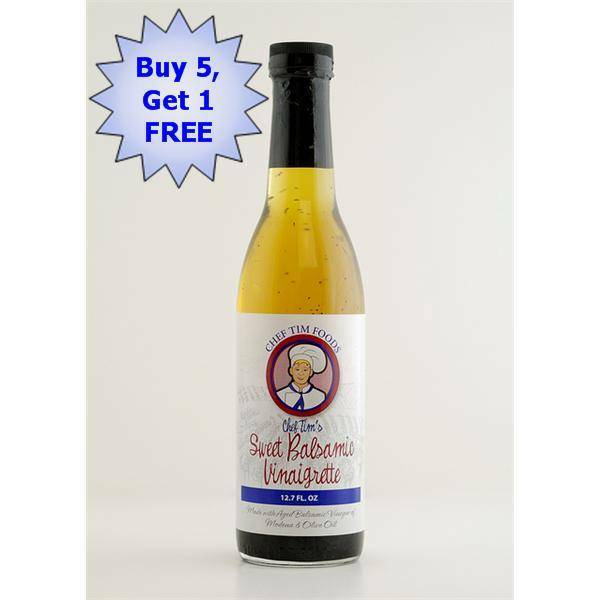 Buy 5 bottles of Vinaigrette or seasonings, and get the 6th one free. This free bottle can offset your shipping costs, and is our way of helping you with that cost. The shipping total only increases by a small amount, and you get an extra vinaigrette. Best that I have ever tasted!! portions. We found your product with pork chops is out of this world!!! One of the best steaks I've ever had! Sweet balsamic vinaigrette made a great meal ! Took a ribeye, lanced it with a fork, sprinkled Morton's "Nature's Seasons" seasoning blend, and liberally sprinkled the "Tim's" into the meat (both sides). I purchased your balsamic vinaigrette at the Pitman, NJ craft show and just wanted to tell you how much I LOVE LOVE LOVE it. It was well worth the price and I am hoping ya'll go back to Pitman again for another craft show where I can buy more. I telll everyone I know about your dressing because it really is the BEST I've tasted, even better than Old Man Rafferty's, which is a restaurant where I used to buy my balsamic from. Thanks so much for this wonderful dressing. I eat salad more because of you. God bless!! !